The Five Varieties of the Human Race. This is a fine example of the 1835 chart illustrating the five different varieties of the Human Race by the important American mapmaker T. G. Bradford. 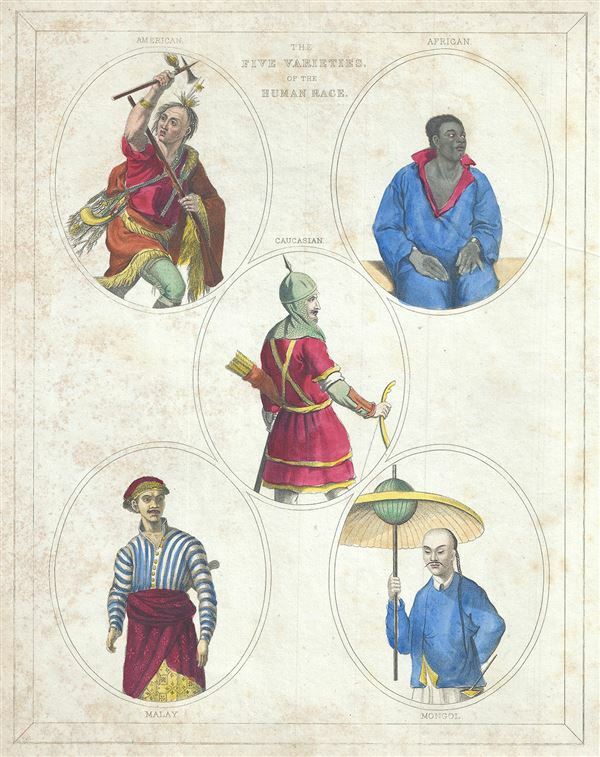 Bradford depicts the physical varieties of the human race by portraying differences in their physical appearance and native costumes, thus representing the different continents. The Caucasian in the center is characterized by white skin and according to Bradford, this race has given birth to the most civilized nations of ancient and modern times, and has exhibited the moral and intellectual powers of human nature in their highest degree of perfection. The American variety, in the top left, is described to have dark and more or less red skin, black hair. The African race, top right, is described by Bradford to have black skin, black and wooly hair. The Mongolian race, bottom right, have olive yellow skin, thin and straight hair and a broad and flattened face. Bradford notes that the Chinese, belonging to this variety are by some thought to have been the most early civilized of all the nations of the world. The Malay race, bottom left, is described to have light tawny or deep brown skin and according to Bradford, some of the nations of this race have long possessed alphabets, and made considerable advances in civilization.